How Millennials Are Changing The Shopping Landscape #Infographic ~ Visualistan '+g+"
Millennials, more than any other generational market, believe in brand loyalty. But they’re going to make you work for it. One clever marketing campaign simply won’t cut it. The landscape has changed and so has the way brands are marketing to millennials. Brands are now working with a shopping audience who wants to be appreciated on an individual level, who at the same time relies heavily on their peer group to help sway their purchasing decisions. They have to know you’re invested and in it for the long haul; not only for them, but for those they care about as well. There are roughly 80 million millennials in the U.S. spending a collective $600 billion per year. And by 2020, this audience is projected to make up 30% of retail sales. That’s 80 million people who are possibly using their smartphones to make purchases at this very moment. They’re telling their friends whether a brand is worth buying into or not. They are looking for the best prices, highest quality, but also, value from retailers they buy from. If they like your brand, they’ll sing your praises to everyone they know. If they don’t, they will be quick to call you out. 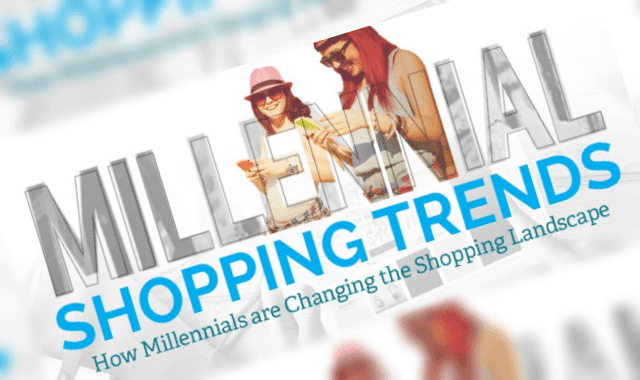 What do these millennial shopping trends mean for retailers? It means standing behind quality products. It’s learning how to connect with the demand of different audiences. Being proactive rather than reactive will go a long way to improve brand loyalty, increase customer retention, and generate more revenue. For better or for worse, millennials have transformed shopping into a shared experience, which is wonderful news for brands willing to step up to the challenge. We’re delivering more of the fascinating stats of millennials shopping trends through our newest infographic below. Share it, if you like it.